BJP's state unit will approach the families under the “Mera Parivar, Bhajapa Parivar” campaign and urge them to put up the party flag over their houses, ahead of the Lok Sabha elections. 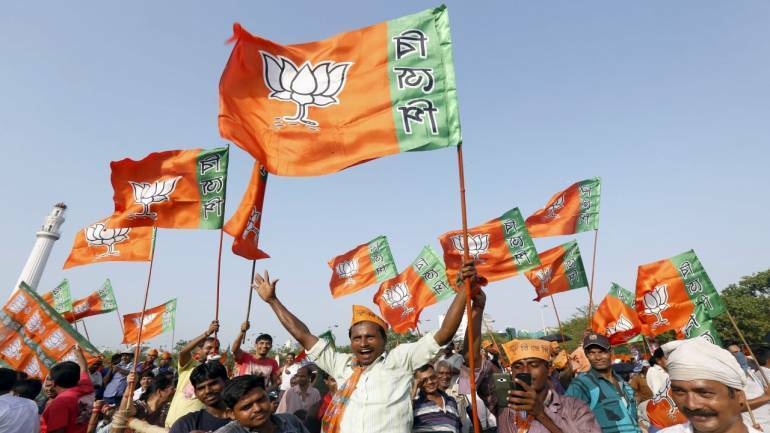 The Bharatiya Janata Party (BJP) is planning to hoist its flag atop houses of 8.5 lakh families in Himachal Pradesh which have benefited from the central and state government schemes, according to a report in The Indian Express. The state BJP unit will approach these families under the "Mera Parivar, Bhajapa Parivar (my family, BJP family)" campaign and ask them to hoist the party flag over their houses to show support for the party in the upcoming Lok Sabha elections. The Mera Parivar, Bhajapa Parivar campaign was launched by the BJP on February 12 by party chief Amit Shah at his residence in Gujarat. The exercise will continue till March 2. The saffron party aims to plant its flag at five crore homes of its workers and supporters across the country. BJP Himachal Pradesh unit has planned to use it to gain support of beneficiaries of government schemes ahead of the general elections. According to state BJP president Satpal Singh, 8.5 lakh families have benefitted from the schemes launched by the BJP government in the state and the Centre. The party is now planning to reach out to those beneficiaries and request them for their support in the general elections to be held this year, Singh told the newspaper. “Our party has supported them through various schemes so we will ask them to support us too, and put up the party flag at their houses to show the support,” he was quoted as saying. The move was however criticised by the Opposition that said it was a “shame” to use government schemes run with government funding for political mileage. “It is a shame that they (the BJP) have stooped so low that they are now launching a campaign to use the government schemes that were propelled with government funding, for political mileage. This is an absolute misuse of government funds,” Mukesh Agnihotri, the Leader of Opposition in the state assembly told the newspaper.